Eintracht Frankfurt was looking for authentic products that reflect the core values of the club and which originate from the region for its collection of fan items. So, it was a home game for the company koziol, which exclusively produces at the company’s headquarters in Hessen. 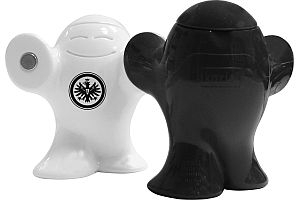 An extensive merchandising collection was developed under the claim “koziol – Made in Hessen“, which is available in the official Eintracht Frankfurt fan shops as well as online. All of the products are produced in the CI colour and imprinted with the club’s logo, which led to the collection scoring a direct hit at the Promotional Gift Award 2018 in the category Merchandising. Whereas for instance the cup utensil Lilli is ideal for a cup of tea at half-time, the mobile phone holder John looks after the remote control in the meantime. Those, who want to dream about Eintracht in the morning already, can have their breakfast served to them on the custom-made haptic-feel Happy Board that is decorated with the club’s logo and thanks to the thermal mug, Aroma, Eintracht also accompanies its fans to the office.